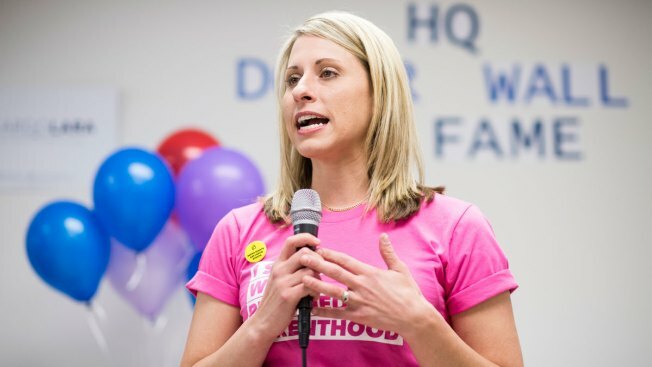 Katie Hill, Democrat running for California's 25th Congressional district seat in Congress, speaks during the opening of the SCV Democratic Headquarters for 2018 in Newhall, Calif., on Saturday, May 26, 2018. More than 90 percent of House Democratic candidates in top races outraised their Republican rivals over the past three months as Democrats continue to hold a substantial fundraising edge with less than a month to go before Election Day. New fundraising figures filed with the Federal Election Commission show that Democratic candidates more than doubled Republican fundraising in the 108 districts considered the most competitive by the nonpartisan Cook Political Report. In some cases, challengers outraised Republican incumbents by a factor of three or more, NBC News reported. Fundraising success is far from a direct predictor of electoral success — some Democratic candidates in high-profile special elections earlier this cycle fell short despite their cash advantages. And some of these Republican incumbents are still in strong shape despite their fundraising deficits.